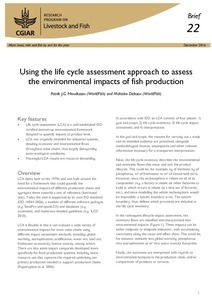 One of the approaches used (in Egypt) was life cycle assessment (LCA). The program has produced two briefs from this experience – the first introducing LCA; the second reporting from an application of the approach in the Egyptian aquaculture value chain. LCA dates back to the 1970s and was built around the need for a framework that could quantify the environmental impacts of different production chains and aggregate these towards a unit of reference (functional unit). Today the tool is supported by its own ISO standard (ISO 14044 2006), a number of different software packages (e.g. SimaPro and openLCA) and databases (e.g. ecoinvent), and numerous detailed guidelines. LCA has already extensively been used for livestock, aquaculture and a range of other food commodities. Its strength in these analyses has been its ability to highlight the most environmentally relevant processes throughout value chains and eventual trade-off among different environmental impacts. Tags: LCA. Bookmark the permalink.